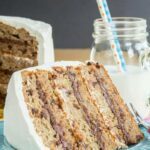 With options to make it traditional or gluten free, this dessert recipe is easier than it looks, and would make an impressive birthday cake. 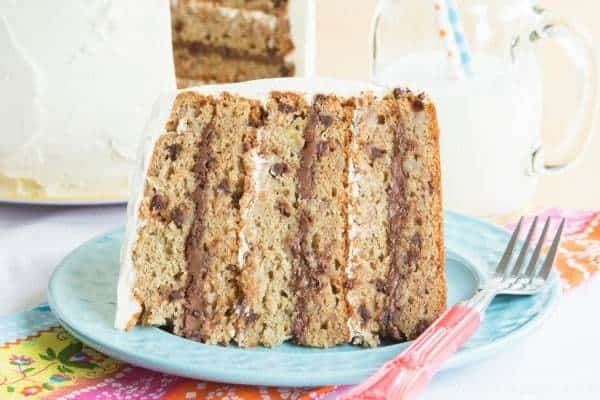 Layers of moist banana cake studded with chocolate chips, separated by schmears of Nutella and cream cheese whipped cream, with options to make it gluten free, and even to use roasted bananas if yours aren’t ripe, you’ll go bananas for this Banana Chocolate Chip and Nutella Cake recipe. You guys, it’s a miracle! 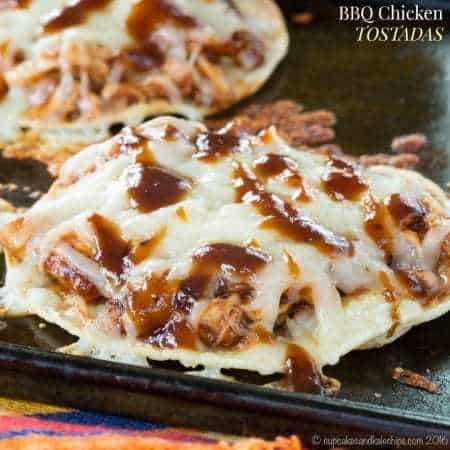 I’m posting a recipe for a food that is being celebrated in one of those whack-a-doodle food holidays the day before the actual holiday. I’m not going to mention that I actually made this cake nearly a year ago. Well, the first time I made it was several years ago, and then last year I made it gluten free. So it was last March, for Little Dude’s second birthday, to be exact, that I made and photographed this cake. And then proceeded to since to him and serve the poor kid’s cake with a slice removed and then smooshed back in place. Oh, cut me some slack. The kid got two cakes. On the weekend before and the weekend after his birthday. Both with slices take out and put back in. The kid that doesn’t like cake. OK, OK, I’m a terrible mother. And a terrible food blogger, because if I were a good food blogger, I’d have posted this recipe (yes the one that has been residing inside my computer for the past, oh, ten months or so) several weeks ago so that it could have made the rounds on Facebook and Pinterest prior to World Nutella Day, which falls on February 5th. That way I’d have had the time to convince the entire world that they absolutely have to make it to celebrate such a noteworthy day on the calendar. And again, if I were a good food blogger, when I decided to post a recipe the day before said food holiday that features said food being celebrated on said food holiday, I might have chose something a bit less involved. 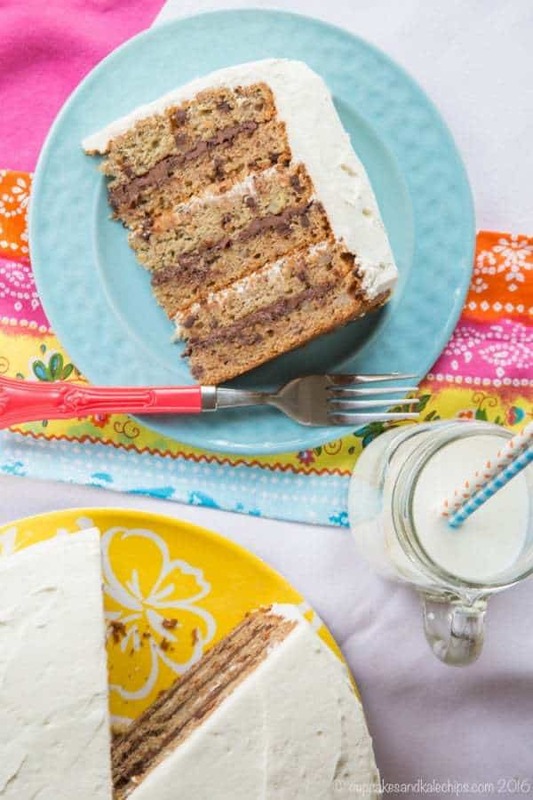 This Banana Chocolate Chip and Nutella Cake is just layers and layers of happiness. 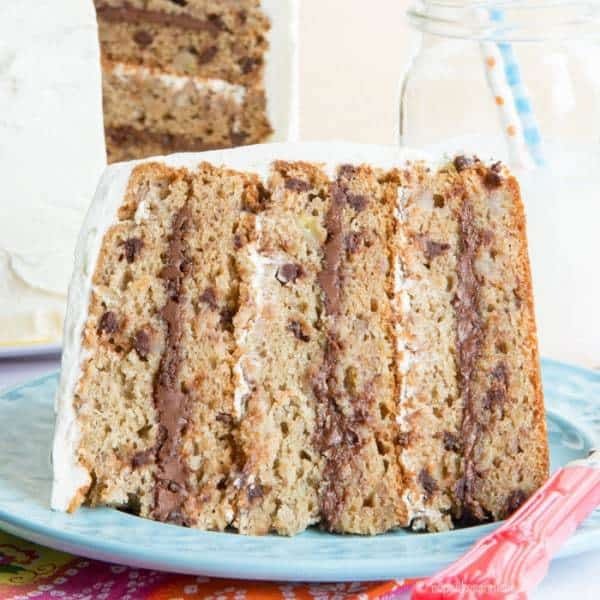 Moist banana cake filled with chocolate chips, slathered with Nutella, then more cake, then, get this, cream cheese whipped cream, then cake, then Nutella, then cake, the cream cheese whipped cream, then cake, then Nutella, then cake. Then the whole thing is covered in that luscious cream cheese whipped cream that is tangy and not too sweet so it balances the sweetness of the cake and it’s so good I could just eat from the bowl instead of bothering putting it on the cake except the cake is so banana-liciously amazing, and you know, chocolate chips make banana cake taste even better, and then the whipped cream just makes the cake even more moist and then the Nutella for a bit of nutty chocolaty goodness, and oh my gosh, so freaking good. Now that I’ve gone on and one about it, let me tell you a few things. 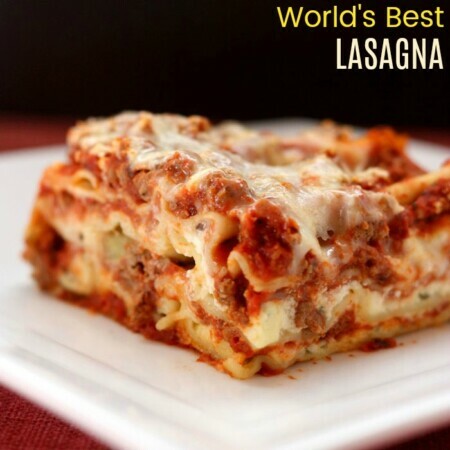 This recipe is slightly adapted from one I found on the Cooking Channel website. Originally I made it as-is. Absolutely incredible and impressive and I might have eaten about half the cake. 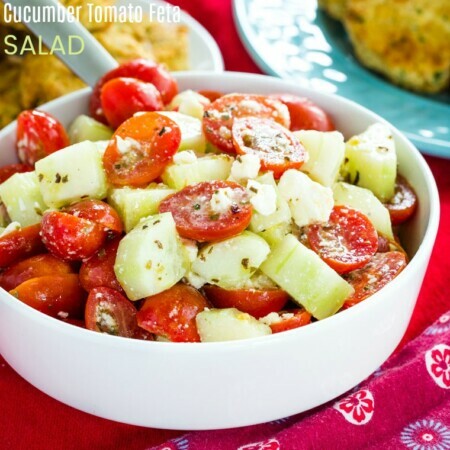 When I made a gluten free version, I simply subbed in my favorite gluten free blend, Bob’s Red Mill 1-to-1 and it worked like a charm. My bananas also weren’t ripe enough, and I had just seen this milkshake from One Sweet Mess, so I decided to roast my bananas. Perfection. 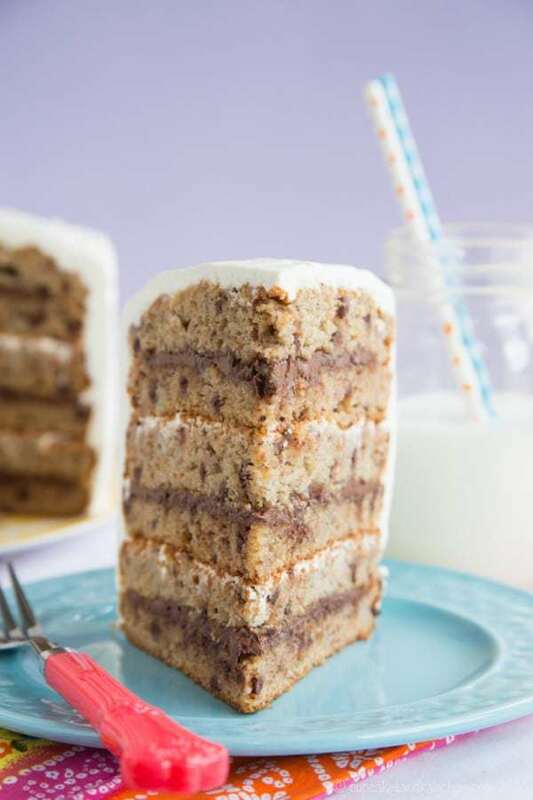 And because I like a good ratio of frosting to cake, I decided to slice each of my layers in half, and alternate the Nutella and Cream Cheese Whipped Cream between the cake layers. It’s a simple step that makes the cake even more monstrously tall and impressive. 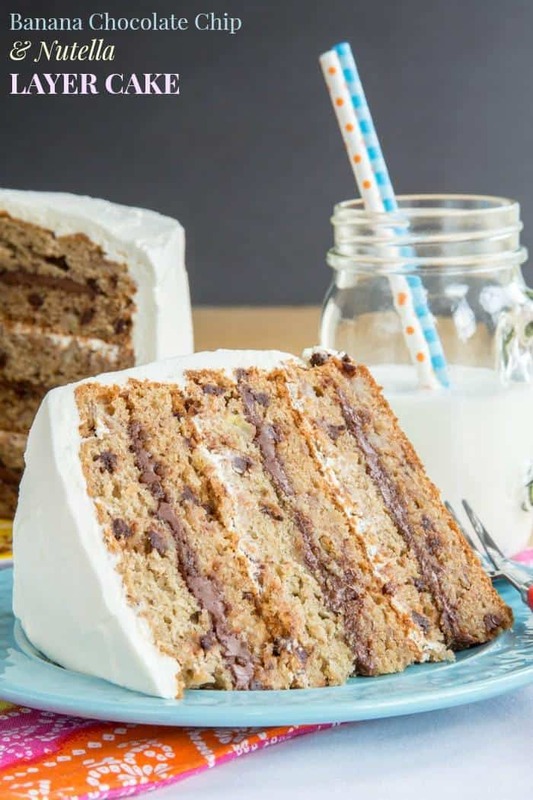 So even if you don’t have time to make this cake for World Nutella Day, someone special deserves this towering cake of awesomeness, even if that someone special is you. Go for it people! Who in your life deserves a special cake? Preheat the oven to 350°F. Coat three 9-inch round cake pans with cooking spray. In a medium bowl sift together the flour, baking soda, and salt. Set aside. In the bowl of your stand mixer or another large bowl, with a stand mixer or hand mixer, cream the butter, sugar, and light brown sugar until light and fluffy. Add the eggs, mashed bananas, Greek yogurt (or sour cream), and vanilla, and blend until smooth. 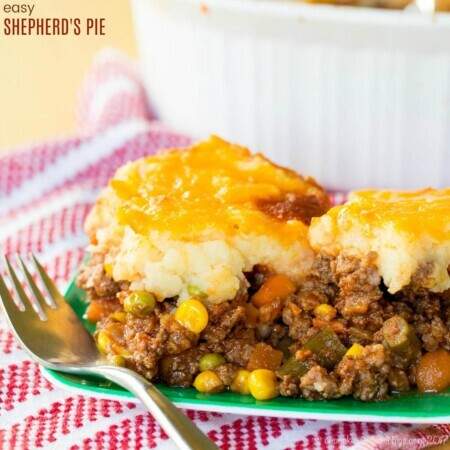 Gradually add the dry ingredients to the wet ingredients, mixing until just combined. Stir in chocolate chips. Divide the batter evenly between the prepared pans. Bake for 45 minutes to 1 hour or until a toothpick inserted in the center comes out clean. Cool the cakes in the pans for 10-15 minutes and then transfer to wire racks to cool completely. Prepare the cream cheese whipped cream. 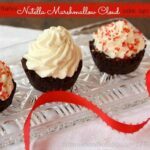 Using a hand mixer or the whisk attachment of a stand mixer, whip the cream cheese, powdered sugar, and vanilla together until creamy. While mixing on high speed, slowly pour in the heavy cream and beat until the frosting is the consistency of whipped cream. Do not overbeat. Store in the refrigerator until you are ready to use. 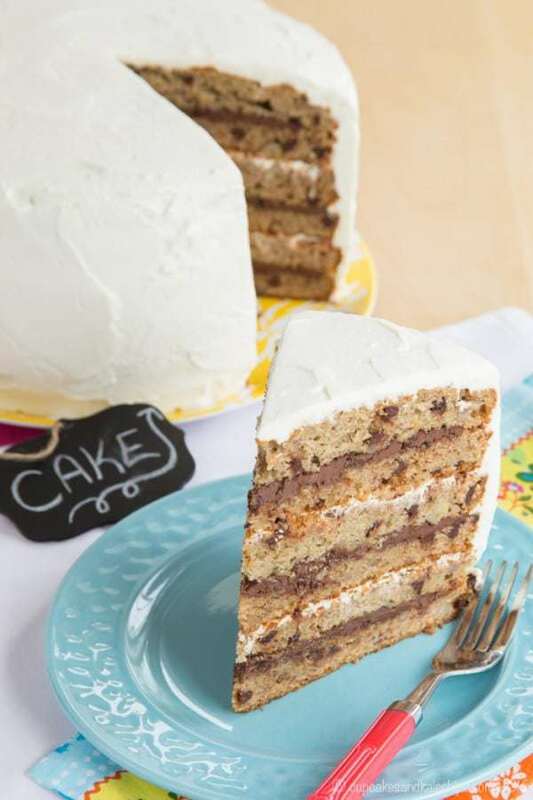 Using a serrated knife or cake cutter, level the top of each cake and slice each cake in half horizontally. 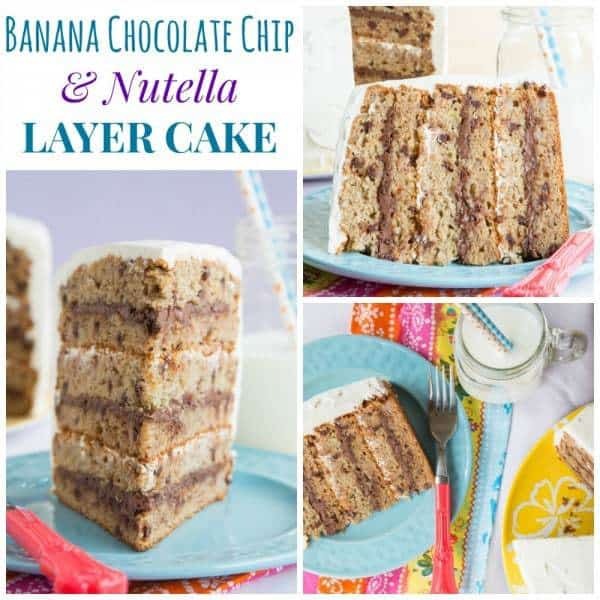 Place one layer on a cake plate and spread with about one-third of the Nutella. Top with another layer and spread with about half a cup of the cream cheese whipped cream. Alternate layers, placing the final cake layer on top, then cover the entire cake with the remaining cream cheese whipped cream frosting. If your bananas are not ripe, roast on a baking sheet in the peels at 400°F for about 15 minutes, or until the peels turn black. Let cool before peeling and mashing. 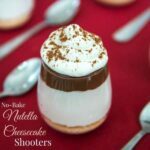 Follow Brianne @ Cupcakes & Kale Chips’s board Nutella Recipes on Pinterest. Do you have to make more of the batter for 9.25 X 13 pan? I want to make this for a cake I’m decorating as a book and want to make sure I make the right amount of batter. Actually, you’ll have more than enough batter for a 9 x 13 inch pan. A 9-inch round cake pan holds 6 cups of batter, so my recipe makes 18 cups. A 9 x 13 pan only needs 15 cups of batter, so you’ll actually have enough left over to make a 9-inch round cake if you want to, or 18 cupcakes! HECK YES!! There are so many layers of pure amazingness in this cake! Right?! How can you go wrong with this combo! That Bob’s Red Mill blend is the best!